The Chemical Brothers are a British electronic music duo comprising Tom Rowlands and Ed Simons, who met at the University of Manchester, England, United Kingdom in 1992. Initially they called themselves "The Dust Brothers." They changed their name in 1995 given the preexisting American production duo "The Dust Brothers," their burgeoning popularity and the threat of legal action from the originals. 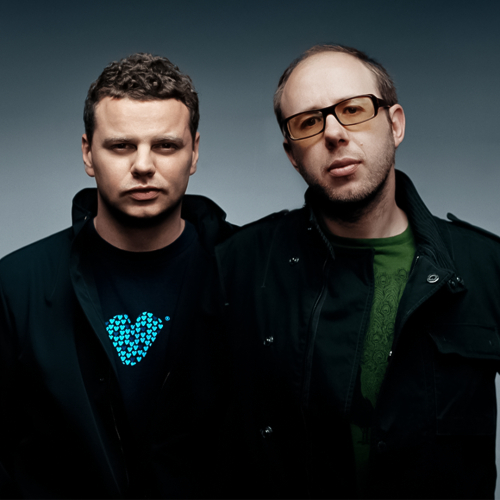 Thus, their first album as The Chemical Brothers was titled Exit Planet Dust. Along with The Prodigy, Fatboy Slim, The Crystal Method, Underworld, Orbital, Apollo 440 and a few other less-known acts, they were pioneers at bringing the big beat electronic dance genre to the forefront of pop culture. They are known for their high-quality DJ sets, an example of which can be found on their album Brothers Gonna Work It Out. Many of their tracks have been in the UK charts as well as those in other countries. Wide belief is that their best album is "Surrender" however "Dig Your Own Hole" is considered their masterwork by a significant number of Chemical Brother connoisseurs and they are known for producing a style which evolves greatly between albums. Their song, Galvanize, was featured in Budweiser TV commercials in the U.S. giving it a great degree of exposure and popularity. They composed the original soundtrack for the feature film Hanna. Songfacts reports that "Theme From Velodrome" was one of five official tracks selected by the Olympic committee to soundtrack the London 2012 Games.